Our N Series backhoe Loaders out-muscle the competition with as much as 65 percent greater backhoe lift power. With our industry exclusive Power Lift, which can be used to break through extreme conditions such as, dry clay or roots with just the flick of a switch. An N Series Backhoe Loader with Power Lift has up to 40 percent more capacity than the competition to lift, curl, crane and move objects. POWER WHERE YOU NEED IT MOST – EVERYWHERE! Put the industry’s toughest loader/backhoe to work on your jobsite. Long before we launched the new CASE N Series loader/backhoes, veteran backhoe operators put our machines to work. And they agree. They’re four tough machines. 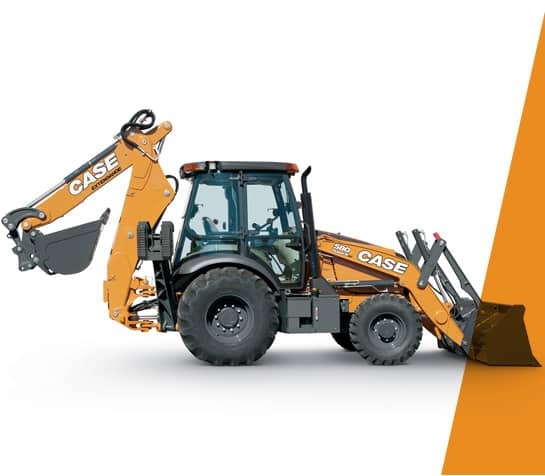 Reengineered from the ground up, the new CASE loader/backhoes deliver industry-leading backhoe breakout force, increased loader lift capacity/reach and best-in-class cab visibility. The N Series introduces a new transmission family, the Powershift H-type and Powershift S-type, allowing operators to shift from the column. The transmission provides a standard kick-down feature and introduces the industry exclusive SmartClutch modulation. The SmartClutch feature lets operators customize the transition from forward to reverse to meet the demands of their specific application. Our new loader arm design will boost your productivity. The loader delivers more breakout force. It has superior reach to dump material into the center of haul trucks with rail extensions. Our new machines have 36 percent greater lift capacity. Plus, we reach deeper dig depths than the previous market leader! When your operation runs day and night, our new cab keeps your operators productive. Floor-toceiling windows provide superior visibility. New rear-quarter windows provide easy communication to the back of the machine and improve cross-ventilation comfort. The highintensity lighting package improves performance by 28 percent, providing superior visibility and overlapping fi eld coverage. And our ‘easy flex’ side lights offer 45 degree rotation to deliver extra lighting where it’s needed most. CASE is famous for easy ground line daily maintenance. Swing-out coolers are easy to access. Axles, with outboard-mounted wet disc brakes, are serviceable without complete disassembly. Add a flip-up hood, spin-on fi lters, grouped site gauges, and you’re saving routine maintenance time. Our customer support team also provides a Customer Assistance Hotline nearly 24 hours a day.